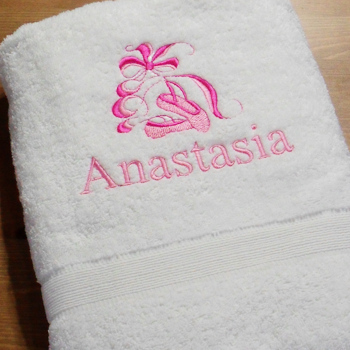 Beautiful Ballet Pointe Shoes embroidered towel personalised with a name underneath. Beautiful Ballet Pointe Shoes embroidered towel personalised with a name underneath. This cotton 550gsm bath sized towel measures 75 x 125cm Single Bath Towel 75x125cm. Or 2pc set of Bath towel and Hand towel. Beautiful Ballet Pointe Shoes embroidered towel personalised with a name underneath. This cotton 550gsm bath sized towel measures 75 x 125cm Single Bath Towel 75x125cm. Or 2pc set of Bath towel and Hand towel. Or 3pc set of Bath, Hand and Face Cloth. Please choose the size and colour of towel or set you prefer. (Face cloth embroidered with name only - no motif) Personalised with your choice of name in the text thread colour and letter font style you select. We will embroider the ballet motif to coordinate with the thread colour you choose.